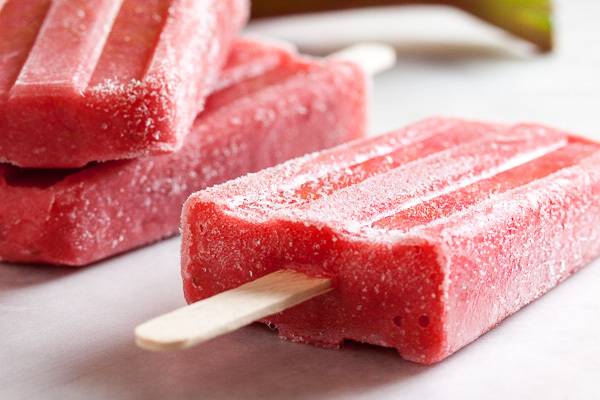 Cherry Popsicles | wanna come with? If you’ve read many of my posts, you’ll know that I generally prefer savoury things over sweet (which is really weird for someone with a baking blog, right?). 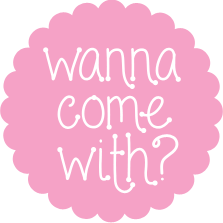 I mean I love chocolate (loooooooove), and cakes and cookies and pies are always welcome, but I’m not a big fan of purely sugary sweets. I’ll pass on most candies. If I’m asked to choose between fruit or a vegetable? I’ll almost always go for the vegetable. I could eat an entire bag of fresh peas in one sitting, but if you offer me some cherries, I might have one or two if I have any at all. I grew up in a small town with a lot of fruit orchards, and almost everyone had apple and cherry trees on their property. I distinctly remember my best friend and I climbing and parking ourselves up the cherry tree for the day, eating every cherry within reach (and hoping her parents didn’t see us and yell at us to come down and stop eating all their cherries). I don’t know if my tastes changed as I grew up, or if I just got it all out of my system when I was younger. Regardless, when I see fresh cherries at the farmers market, it just doesn’t really excite me. Meh. Which is unfortunate, because there are a lot of them, and I can acknowledge that they look amazing right now at their peak. 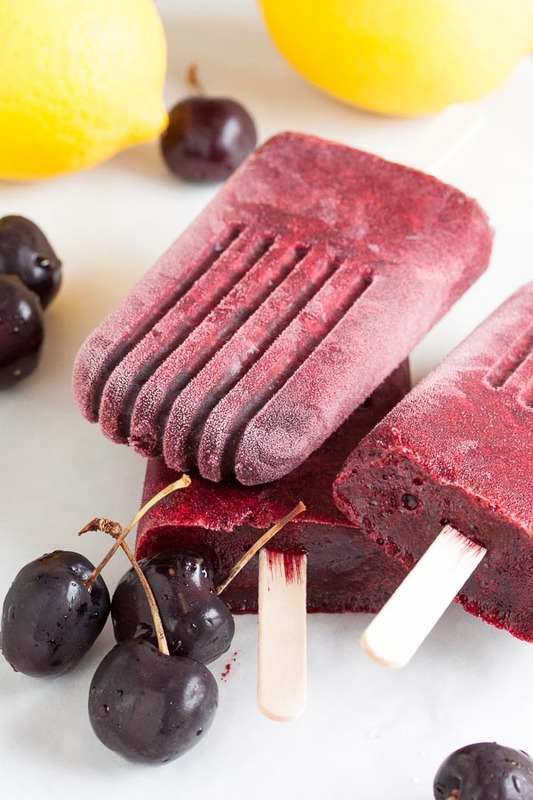 So here I am, flipping through popsicle recipes looking for inspiration, and I see a recipe for cherry sorbet – which can easily be converted to popsicles. I may not be excited by the prospect, but I’ll bet my coworkers will love them. So off to the market I go to buy two pounds of cherries. And then? I have to pit them all. You guys, my kitchen looked like a murder scene. I don’t know how, but there was cherry juice everywhere. It was on the walls! Once the pitting was done, the cherries were heated to intensify the flavours. 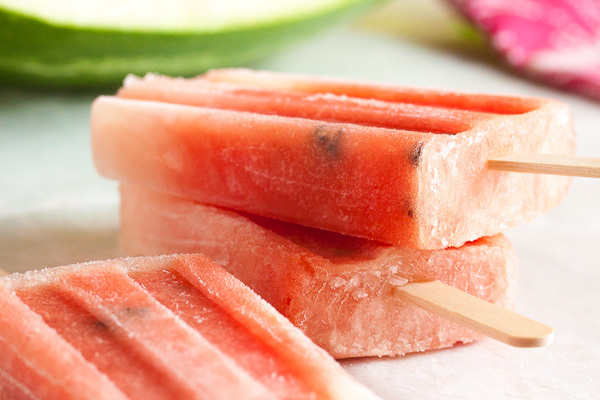 And then the popsicle came together really easily – just a quick blend and freeze. And I was totally right – my coworkers loved them. They disappeared in record time, and then for days afterwards people kept popping their heads in my office to ask if there were any more, looking really sad and pathetic. Cherry season doesn’t last long, so if you love cherries and want to prolong their goodness? Think about making these popsicles. 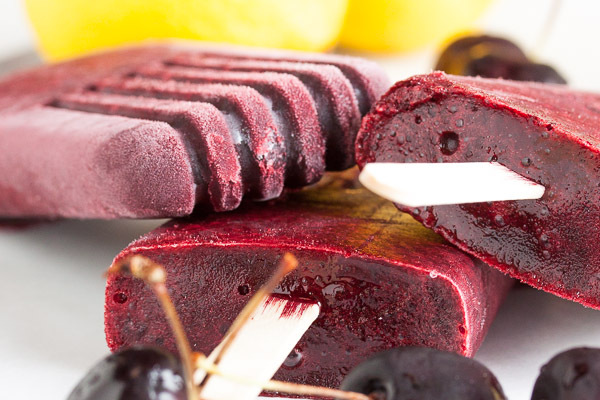 Think about icy cold cherry popsicles in late summer when it’s really hot. Yup. You know you want them. Adapted from The Perfect Scoop by David Lebovitz. The original recipe includes instructions for processing in an ice cream maker. 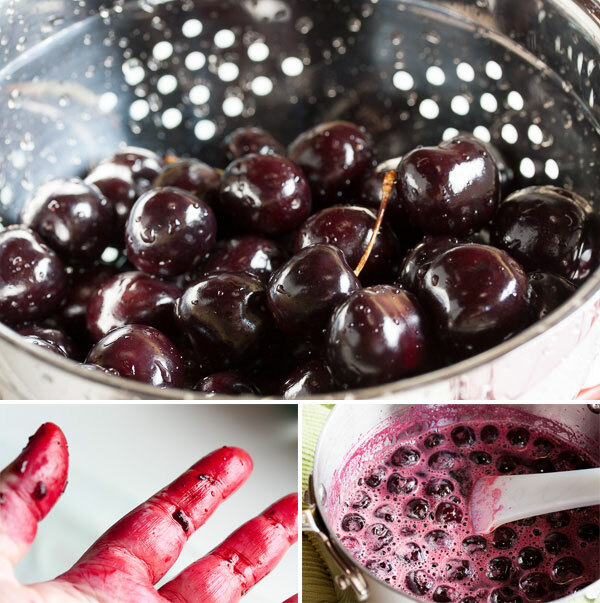 Remove the stems and pit the cherries. Combine the cherries, water, sugar, and lemon juice in a medium non-reactive saucepan and warm over medium heat until the mixture looks juicy. Continue to cook for 10-15 minutes until the cherries are soft. Transfer the mixture to your blender and add the almond extract or kirsch. Purée until smooth. 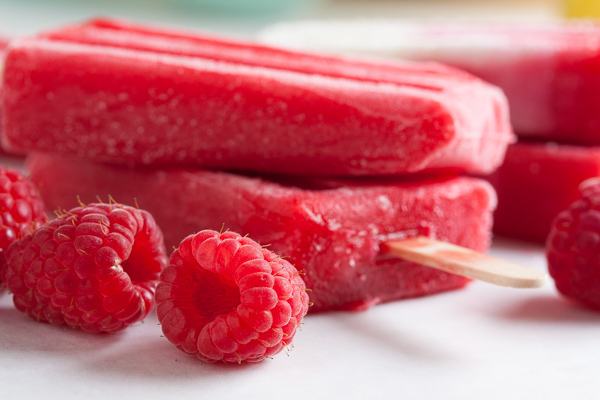 When the mixture is as smooth as you'd like, pour into your popsicle moulds and freeze for at least 5 hours. Enjoy!